Bamboo pole design of the Hawaiian Luau pattern. From the 1930’s to the 1950’s California experienced a boom in the manufacture of local earthenware pottery made from local clay. These small and large operations produced domestic earthenware that reflected the laid back lifestyle of California living. At the peak of the boom, 1948, there were 800 potteries operating in the Los Angeles area. By the late 1950’s most of those potteries had sold their designs to foreign markets and had closed their doors. The Santa Anita Pottery manufactured earthenware in Los Angeles from 1939 to the 1960’s. The company was best known for using a ‘drip glaze’ decoration. The drip glaze pottery was applied mostly to individual or compartmental dishes in shades of green or orange. 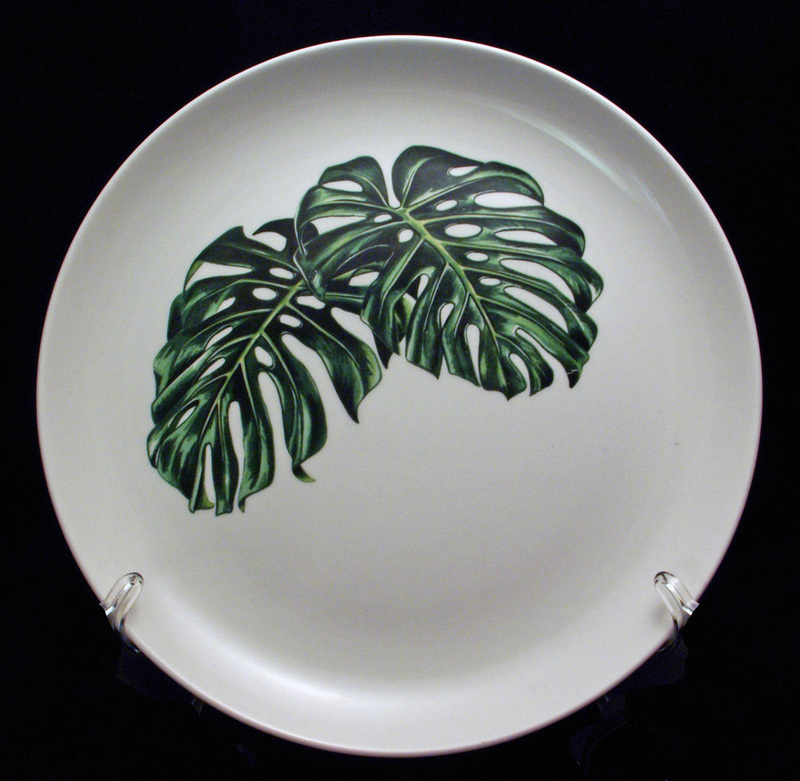 Santa Anita produced a popular 'Hawaiian themed' dinner ware collection, and several other hip designs. Santa Anita Ware pottery conjures up a graceful era in the Hawaiian Islands. 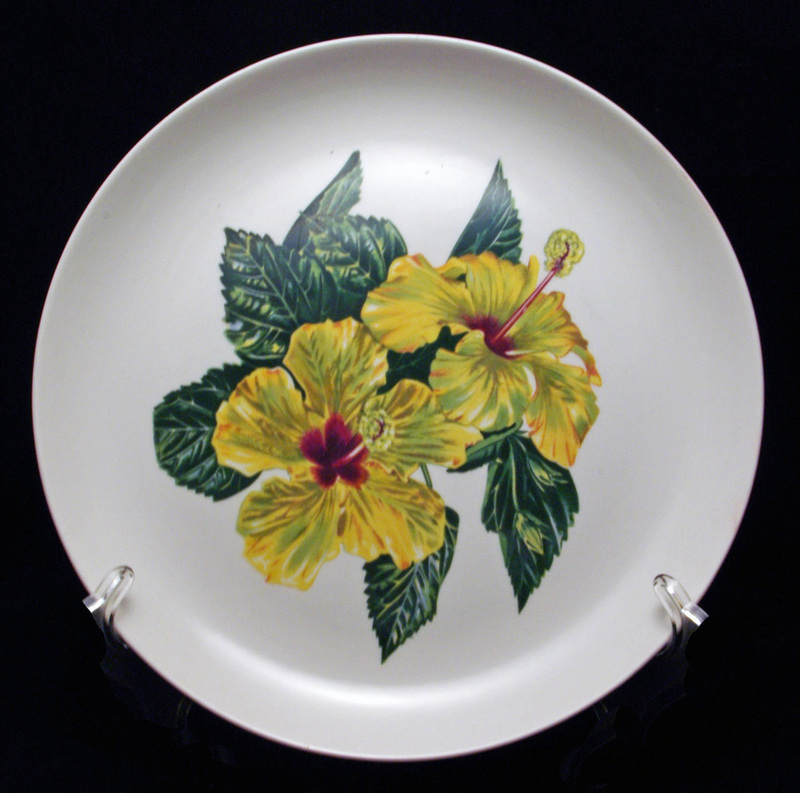 Santa Anita Ware's "Flowers of Hawaii" line was popular in the 1950s. The large floral designs were done in a transfer process rather than hand-painted, keeping this line relatively affordable. The Hawaiian themed dishes were usually part of a dinnerware set and were decorated with a Hawaiian native floral transfer design. These dishes became very popular as wedding gifts for Hawaiian newlyweds. In Hawaii, the sets were sometimes given as wedding gifts to lucky brides, and some people swear their tutu had every piece of all nine patterns -- butter dishes, chip-and-dip sets, the works. Of course, in those old houses with the built-in shelves and glass-doored pantries, Grandma had the room for all those dishes. 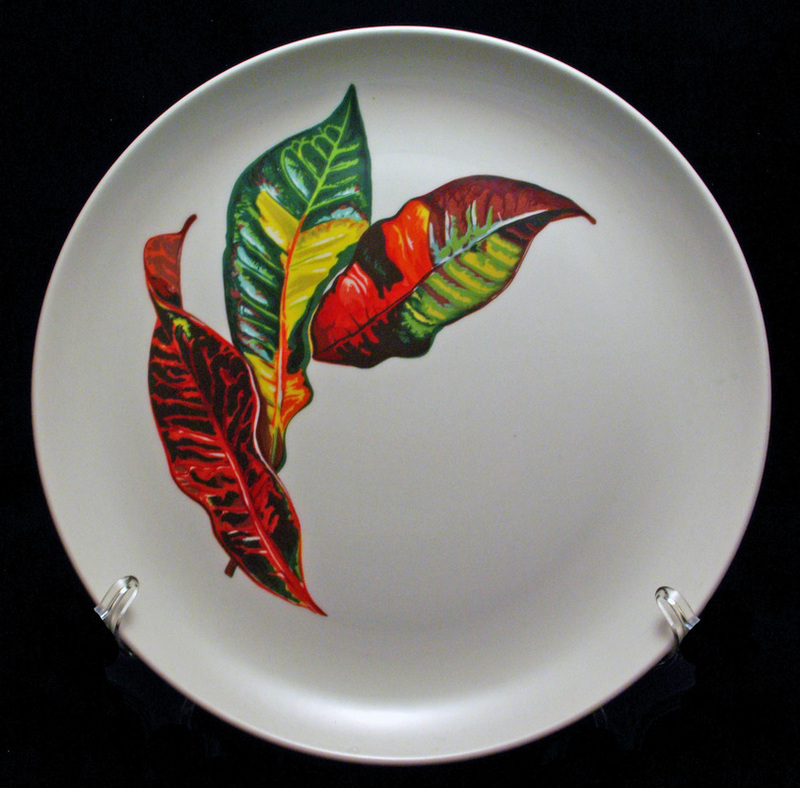 The Hawaiian dishes featured nine different designs depicting Hawaii flora: anthurium, yellow hibiscus, torch ginger, bird of paradise, shell ginger, cup of gold, night blooming cereus, croton leaves and the hard-to-find monstera leaf pattern. These vintage Santa Anita earthenware pieces have once more become popular among collectors of California pottery.